John Bannister, centre, with Scottish Crofting Federation chairman Russell Smith, right, and chief executive Patrick Krause. A “stalwart” of the Highland crofting community has finally stood down from his post after multiple failed attempts at retirement. 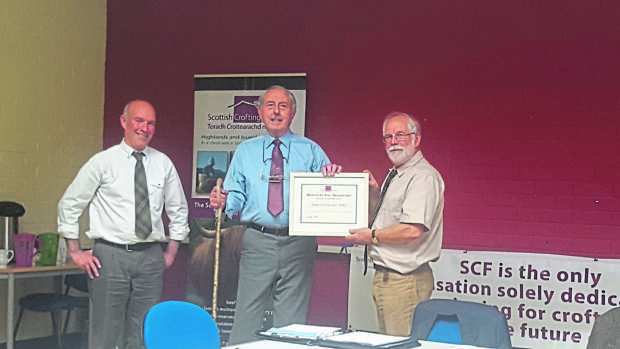 John Bannister MBE left his post as company secretary of the Scottish Crofting Federation (SCF) at its AGM last Friday. He leaves behind him what was described as almost a decade of “dedicated service” to the crofting community as company secretary. Originally a policeman from the Midlands, Mr Bannister arrived on the Isle of Skye with the intention of retiring for the first time in the 1990s. But instead over the next ten years he established a successful croft from nothing and helped formed the Skye and Lochalsh horticultural development association. He then served as the local grazings clerk and secretary to the Sleat and Strath branch of the Scottish Crofting Union, later renamed the SCF. In that role he was an “innovator” in that he designed and managed the SCU/SCF crofting induction courses which have grown in demand over the years and are now used region-wide. He also formed and administered the Highlands and Islands crofters and small landholders training panel and secured funding for the SCF training programme. Mr Bannister was also instrumental in the establishment of the Glenelg ferry community company – all this while he was retired. Then in 2006 he was made an MBE for his services to crofting which was presented to him at Buckingham Palace by Prince Charles. He chose to step down from his role as SCF training manager but again retirement did not last long because he continued as company secretary. But that work has been praised by former colleagues in the SCF like chairman Russell Smith who said his work was “the fixed point around which we all circulated”. “He was also secretary of the Skye and Lochalsh branch of SCF, and a great passion of John’s was practical, accessible training in crofting skills. Mr Bannister proved equally adept when dealing with the fine points of regulations as company secretary.